The German philosopher and cultural critic, Friedrich Nietzsche, believed that in order to become the desirable ‘Ubermensch’, a person had to develop the ability to rise above difficulties and circumstance to embrace life. This is accomplished by avoiding numbing narcotics and instead engaging in moral education through occasionally painful experience. 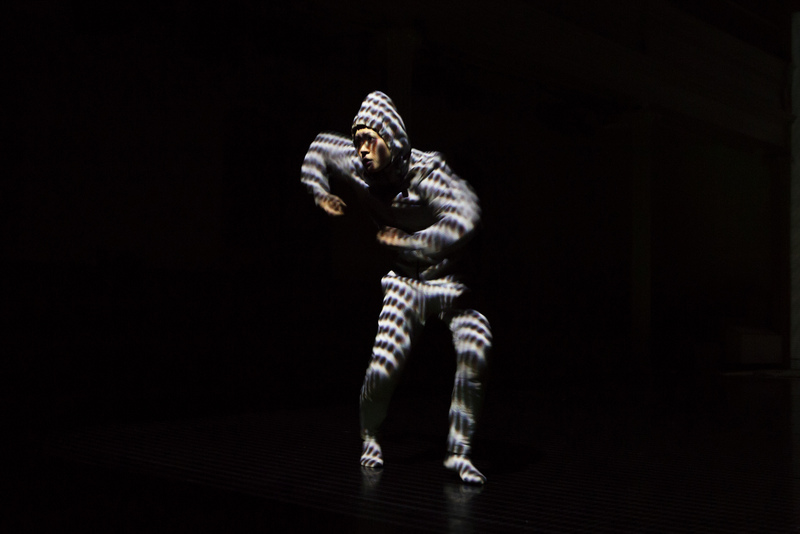 Inspired by Nietzsche’s work, Human All Too Human, choreographer Christine Bonansea creates a provocative experience with her evolving work, OnlyHuman. 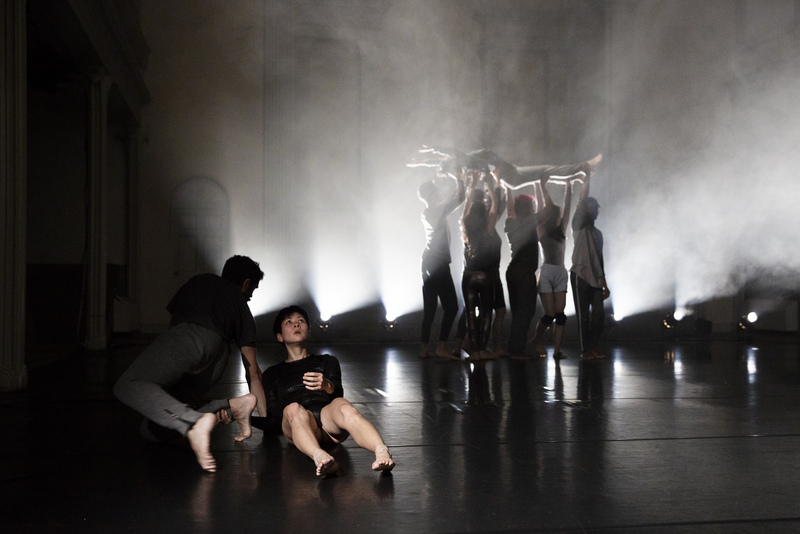 Originally created as a solo, the piece features a cast of soloist and nine supporting dancers, animated visuals from photographer Robert Flynt and video from Yoann Trellu. 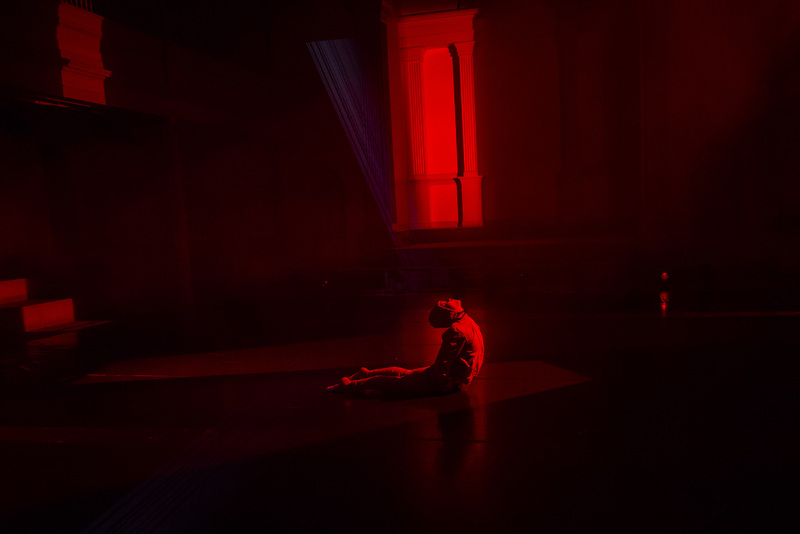 A futuristic, digitally-influenced environment is created with a droning soundscape from composer Nicole Carroll, while the expansive performance area of Danspace Project at St. Mark’s Church is transformed with lighting design by Solomon Weisbard to appear more like a laser-filled arena or inner-workings of a computer system than human-made holy ground. the work challenges both audience and performer. The opening solo lasts well over ten minutes, a feat of endurance for any performer. 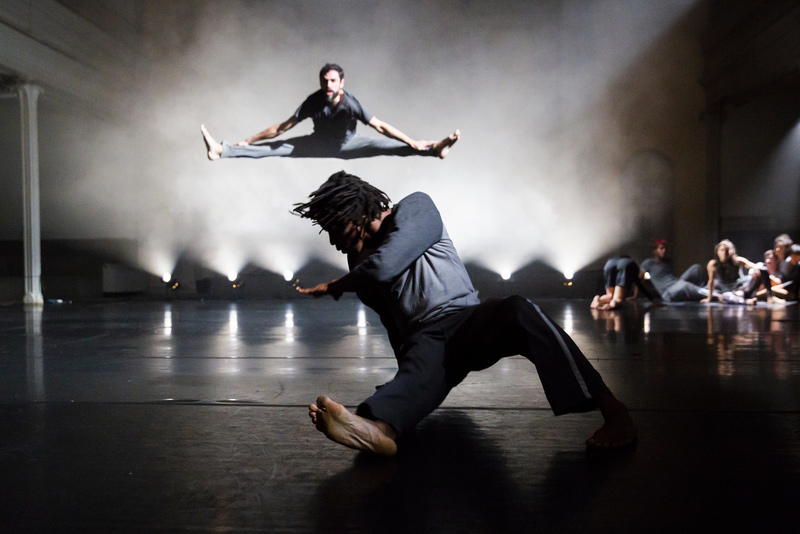 Later dancing sections from the ensemble incorporated rigorous and repetitive jumps and aggressive floorwork the dancers hurling themselves towards the ground with speed and force. There was a visceral sensation of bones making contact with the floor, bodies smashing into one another, their breath could be heard in moments of silence and through the static, mechanical sounds. It seemed inhuman what these individual performers seemed capable of in energetic outbursts and control, equally inhuman in pursuit of why anyone would execute these exhausting, uncomfortable actions. This is dancing that goes against human instincts and abilities, all the more engaging because of this divergence. As is true in many societies, the question of beauty and freedom in OnlyHuman is subjective, the obvious representations of power and presence is not. Bonansea’s crafting of this piece is not only masterful for the empathetic experience of the audience merely watching the performers, but in the non-passive response that is provoked. 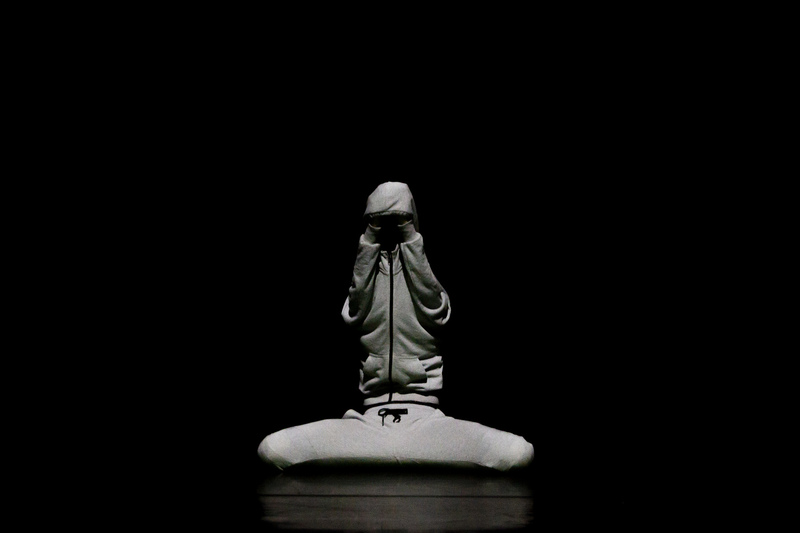 One especially powerful moment comes while soloist Mei Yamanaka manipulates the hood of her pedestrian sweatshirt, extending and contorting the shape to create an alien creature which acknowledges the gaze of the audience, and charges us down before the costume and therefore the performer’s appearance, is again altered. It was both terrifying and captivating. 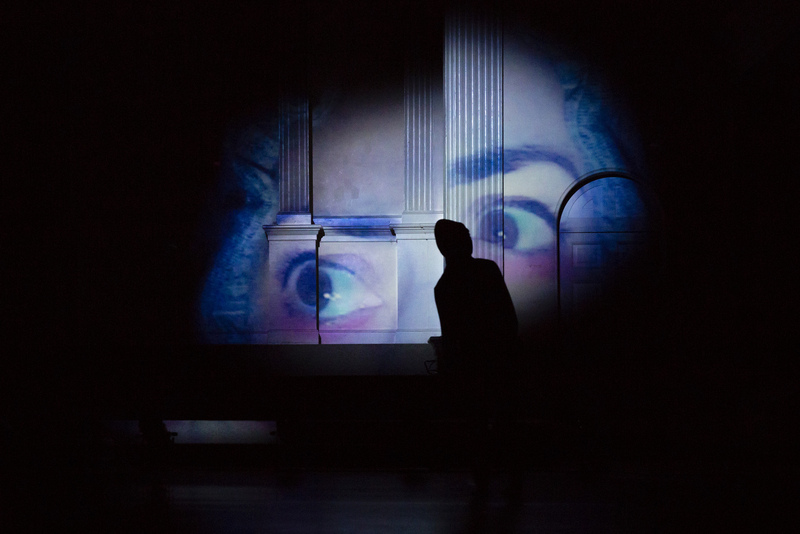 Equally uncomfortable were long moments of silence or quiet hums in the sound, if only to draw attention to the participatory rules of audience engagement. Is it just me, or are these always the moment when a sneeze start to come on or a cramp shoots up an otherwise-relaxed leg? The juxtaposition of silence and action forces attention on the kinesthetic experience appearing before our watchful eyes and within our own human forms. 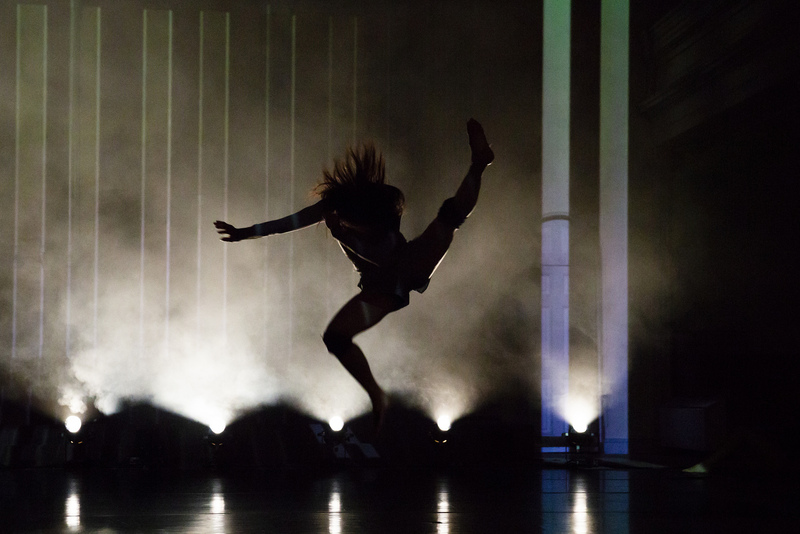 One of the most compelling aspects of the choreography was the diversity of style and allowance for each dancer to individuate themselves within the cast. It was hard to imagine this group as an actual community when some dancers had balletic lines and promenades, some had what looked like break dancing movements, some stuck their tongue out or laughed maniacally. The choreography reached into obscure corners of creating identities for each in this invented collectivist society that seemed neither concerned for the well-being of others or set in a hierarchy of dominance. Large ensemble sections explored notions of freedom and illogical behavior in parallels to the ways game theory works within societal structures. Perhaps the different appearance, strengths, and styles of the performers made it more difficult for them in unison movement, as they weren’t together in a heavy shuffling motion. Their jumps left the floor on different counts and was the one moment where they seemed unsure of themselves, under-rehearsed. In those few isolated moments that they danced together, they should have been more together. Because art is subjective, exploring the contradiction of beauty and destruction poses a challenge. Many sensory elements from the textured lighting or the group versus solo performance enhanced understanding of aggression, at the very least. This is an important current discussion, especially when exploring the gendered aspect of humanity. Due to the expansive movement styles and qualities, the pedestrian yet athletic costumes of the ensemble the piece seemed to delve into something of the androgynous. It was aesthetically engaging and intellectually provoking to watch the cultural threat of genders representing unexpected levels of aggression. However, it is another challenge to ignore that the characters who were lifted were usually, if not always women. One of my favorite moments of the choreography was when the group clustered around a pole on the edge of the dance space, and one female climbed up their backs to stand towering over them gripping the pole, only to lose her grasp and fall sideways. For me, it as the clearest example of destruction in the choreography. And it happened twice with the same dancer. Part of me really wanted to watch a male dancer topple from the tallest position. However, in our western society where saying what you want is considered dominant, perhaps a woman such as myself shouldn’t express that wish. There is more to explore or expand within this work in the representations of what it is to be human by clearly showing the contrasts which exist within our current or futuristic societies. Seeing the females consistently lifted or falling played into a pre-existing narrative. Structurally, I would have enjoyed a development of characteristics to better define notions of beauty in contradiction with destruction, if only to understand the boundaries set within this piece and to better recognize where these lines were blurred. The movement vocabulary was so wide-spread and there were so few moments of repetition for the audience to notice contrasts, it felt more like an individual choice to assign labels of beauty. Personally, I feel that there is a cultural stigma that art is something pleasant, to be passively taken in. We envision a nice trip to the museum, of looking at paintings of old and feeling educated and peaceful while reveling in these grand accomplishments by skillful artisans. It seems to me that what is often forgotten is that though our air-conditioned, carefully curated experiences may be pleasant, not all art was created to soothe or entertain. And I get it, why would anyone spend money on a ticket for an experience that is not going to enhance our comfort or ease in life? It is highly possible to achieve Nietzsche’s goal of increasing our moral aptitude and intelligence by allowing art to provoke sensation- recoiling in horror, wanting to protect or be protected from these performers, empathy, admiration- to richly explore the complexity of human life. Sometimes it isn’t pretty, but to these subjective eyes, it was extremely beautiful.